In most cities, when you want to see great art you go to a museum. 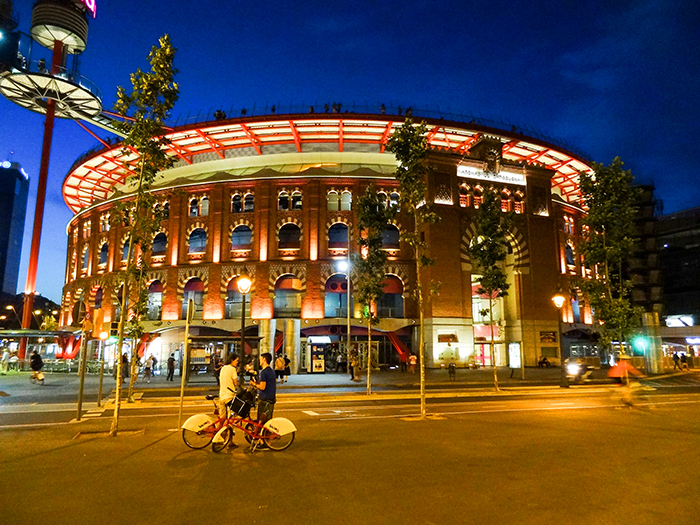 Incredibly, if you’re in Barcelona, you just take a walk. Few places in the world have the wealth of architectural treasures you find in Barcelona, which includes a staggering nine UNESCO World Heritage Sites. By comparison, Paris has only one site, the entire greater London area just four. 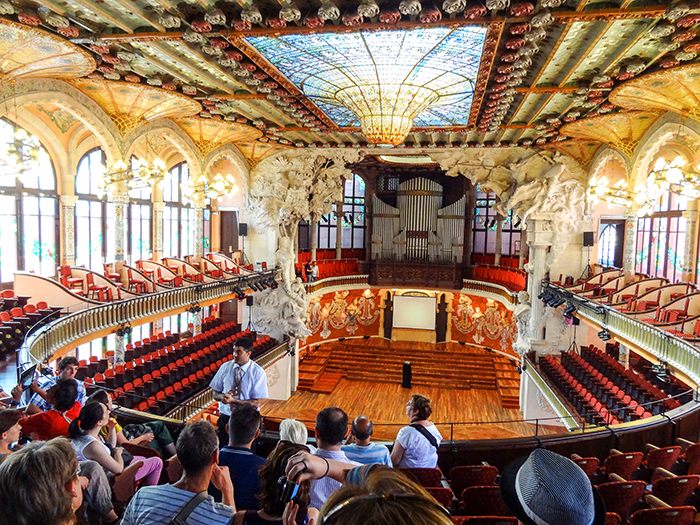 It’s the beauty of these sites, along with the city’s many museums, galleries, music history (the Palau de la Musica is incredible), and wealth of good places to eat in Barcelona that makes the city an exceptional travel experience. Having the opportunity to spend five days in Barcelona, my wife and I decided to stay in an apartment, not a hotel. Our thinking was it would provide a more personal view of the city. Since we weren’t surrounded by tourists 24 hours a day, we were able to get a genuine view of the city. In fact, it was one of the best things we did. One thing we regretted not having done, however, was buying our entrance tickets to Sagrada Familia in advance, since we had a long wait on line. There are many organizations through which you can rent apartments overseas. We selected the British company HouseTrip, which is now part of TripAdvisor. The apartment we selected was near the Plaza España and the city’s old bull ring, now a shopping center. It was just a few minutes away by metro from the historic district, including many of the Antoni Gaudi buildings we wanted to see, and the tourist magnet of La Rambla. La Rambla is where the terror attack in Barcelona occurred in 2017. But you need to experience this beautiful pedestrian avenue if you are to experience the city itself. In fact, you really can’t avoid it. The wide street stretches from the shores of Mediterranean up to Plaza Cataluña, linking many of the sites in the historic center. 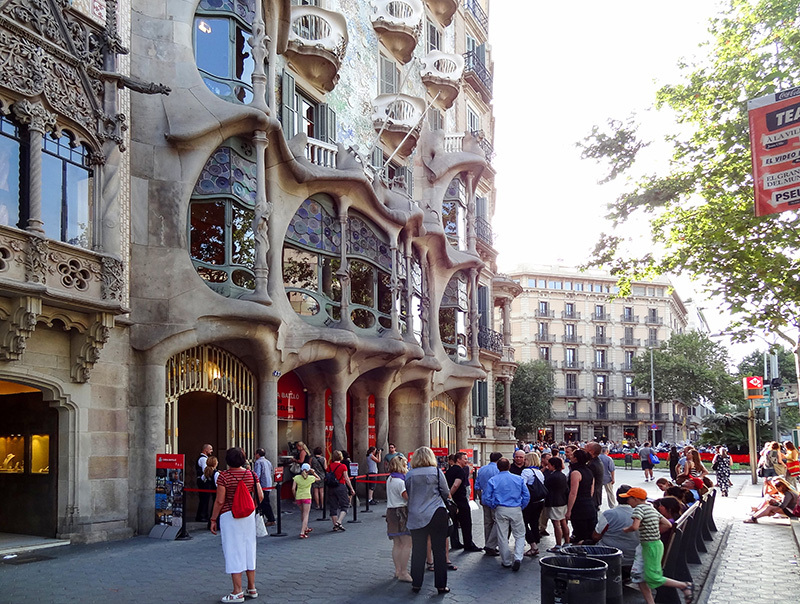 Barcelona owes much of its fame to the Antoni Gaudi-designed buildings. The father of Barcelona’s Modernist architecture, Gaudi’s distinctive architectural style was greatly influenced by nature. As you might expect, you see his masterpieces all over the city: the unusual Casa Batlló, the magical Park Güell, his landmark Palau de la Musica, beautiful La Pedrera, and his magnum opus, the incredible Sagrada Familia. Construction of the soaring Sagrada Familia began in 1882 and continues to this day. But even without the Sagrada Familia and Gaudí houses masterpieces, there’s enough in Barcelona to keep any traveler busy for weeks. 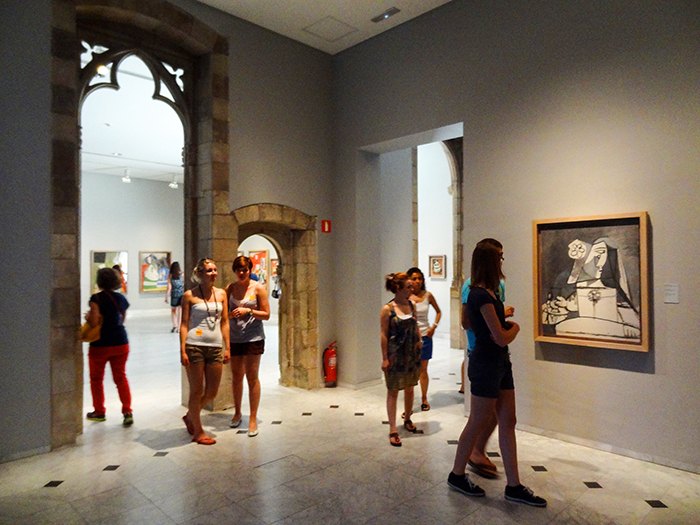 One of the biggest tourist attractions in the city is the Picasso Museum, which rambles through five medieval buildings. It contains a collection of paintings and drawings from the artist’s youth, as well as pieces from his later life. And there’s the Palau de la Musica Catalana, another Gaudi building, which is a lavish jewel of a concert hall that rivals any other in the world. It is so stunning, a glass building has been constructed around it to ensure its preservation. More than 300 concerts are still held in the concert hall every year. Its guided tour, which takes about an hour and a half, is well worth taking to see the interior. 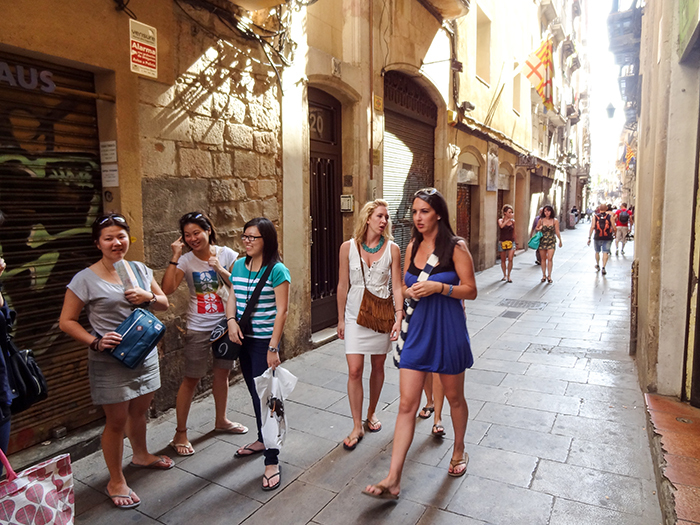 Also wander over to the Cathedral of Barcelona, in the center of the city’s old, historic Barri Gòtic, the Gothic Quarter. Amazingly, the Cathedral’s construction, begun in the 13th century, took 600 years to complete. In addition to several altars, it also has palms and fruit trees, and a pool with a flock of geese in its cloister. From the Cathedral you can see the whimsical curving roof of 19th-century Santa Caterina market. It’s painted to reproduce the colors of fruit and vegetables in the market below. The most popular area of the city is L’Eixample – Gràcia area. It is here where you find three of Gaudí’s most renowned works: La Pedrera, Sagrada Familia and Park Güell. The Sagrada Familia is the most popular attraction in the city, as one sees by the line that snakes around it. Since the wait can be very long, and then you still may not get in, it’s best to buy your Sagrada Familia tickets online in advance. 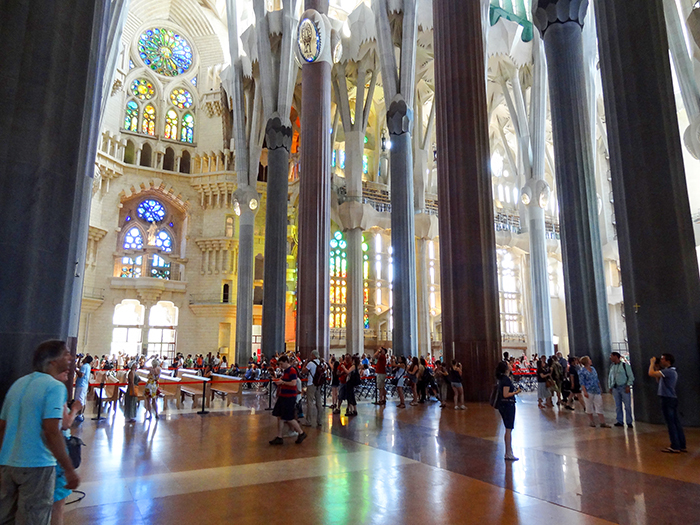 You can buy Sagrada Familia tickets from Get Your Guide (above). Surprisingly, inside I found the beauty of the church overwhelming. It’s a grand architectural spectacle unlike anything I have seen anywhere, a grand monument to the genius of Gaudí. 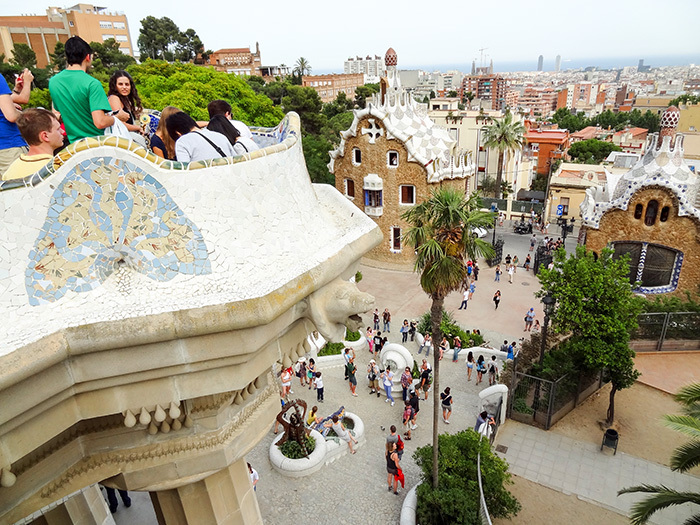 Gaudí’s Park Güell, one of the most colorful spots in all Barcelona, is also beautiful and was originally planned to be a residential area. It’s one of the finest examples of Gaudi’s imagination and clearly demonstrates his bond with nature. In fact, it is one of the most amazing and beautiful parks in the entire world. 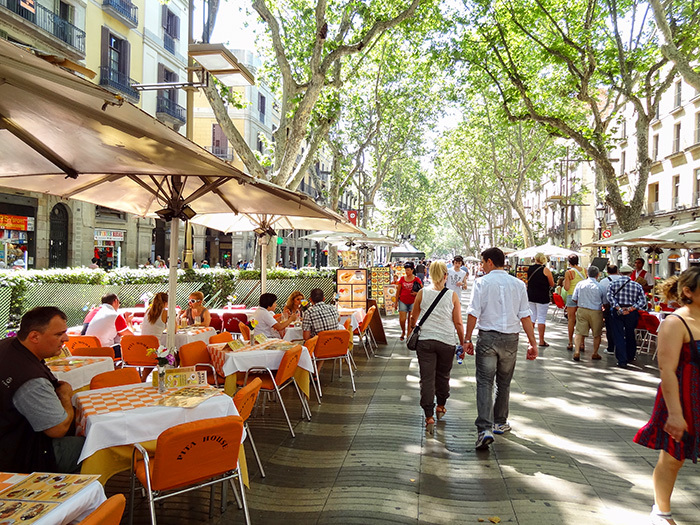 As much as it is a city of art and architecture, Barcelona is also a city of restaurants and cafes. 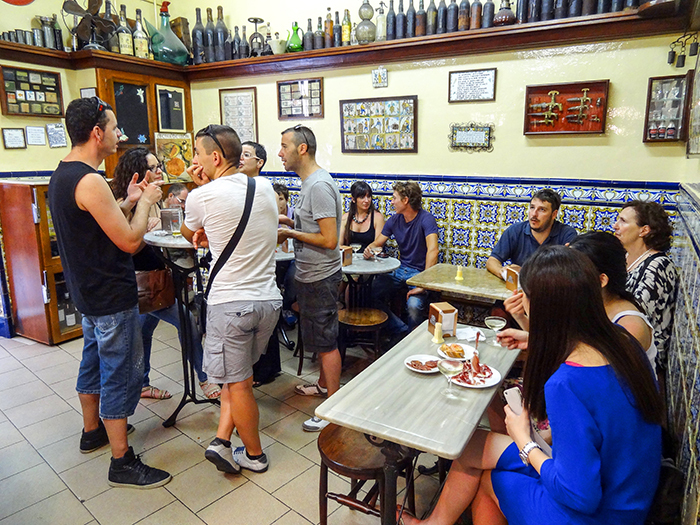 In fact, you’ll find many good places to eat in Barcelona. 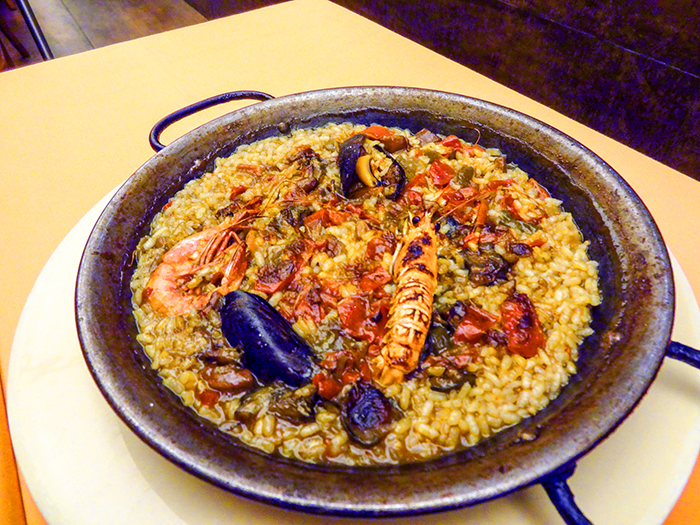 We were fortunate enough to have the owners of our apartment, Mercedes and José, suggest two of their local favorites to us, which they considered good places to eat in Barcelona. 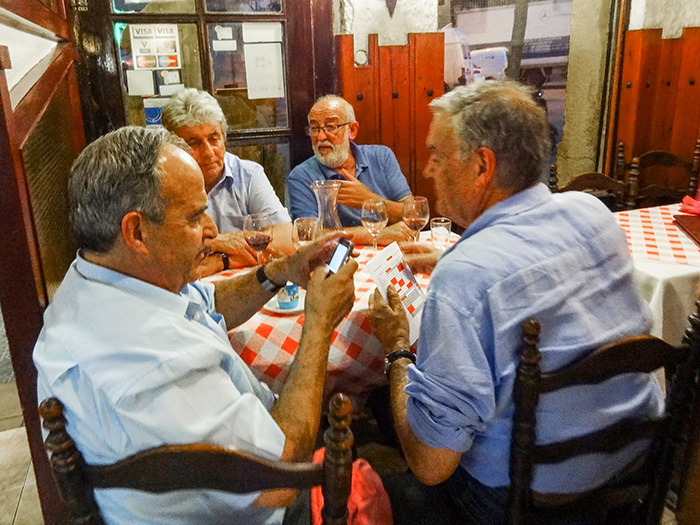 Although the two Barcelona restaurants, El Pa I Trago and Els Ocellets, turned out to be quite different from one another, both were excellent restaurants. El Pa I Trago is a small cozy Barcelona restaurant / taverna with wood and tile walls, that serves typical Catalan cuisine. Although we were the only non-locals there, the taverna had menus in five languages. It was a great value also — our large dinner of steak and fish, with appetizers, sides and wine was $100 for two. On the other hand, the restaurant Els Ocellets was a little more modern, with its logo of a bird looking as if it had been painted by Miro or Picasso. Here, too, we had a great multi-course meal with wine, also about $100. Surprisingly, while we were sipping after-dinner drinks following our meal, all the lights in the small restaurant went out. The kitchen door opened and the owner came out with a birthday cake for a woman at a nearby table. Everyone immediately burst into “Happy Birthday” in Spanish. I sang along in English…off-tune, as usual. Start saving Donna, Barcelona is unique in the world. I love the art and architecture found in Barcelona, every corner you turn has something interesting to discover. Picasso’s ‘Portrait of Jacquelin’ blew me away! The Picasso Museum and the entire city blew me away! Better then the guide books!! Spent a week there in 2016 at a VRBO rental near Catalina market.So many great things to see. We always enjoy the Hop On Hop off buses to get your bearings. Go to the Gaudi interpretive center next to the Cathedral before you see the Sagrada and other Gaudi structures. Montserrat is worth a day trip if you have the time.Tours leave from main square. Thank you for your comments and pictures. Barcelona has been on my list of places to visit for awhile. This just whets my appetite even more. Hope to get there in the next year or so. Hi to Marguerite. You’ll love Barcelona. It’s a great city with great food and a lot to see and do. I also need to go back and, hopefully, will some day. Just reminiscing on my wonderful 2night/day weekend stay in Barcelona last week. Such a beautiful and friendly city. Got to go back soon. I haven’t been back in a few years and every year I keep telling myself I need to go back.